Sometimes it is helpful to look at 'models' from psycho-analysis to understand the toxic 'dances' we get into in our relationships. Many of the steps of these dances are learnt as children - either from watching and listening to our parents or from the dynamics of our early family life. This means we are unconsciously very adept at taking a role which perpetuates the dance and keeps us stuck in a less than useful behaviour. Here is an excellent explanation of the model by John Goulet, a Marriage and Family Therapist from Ventura, California. 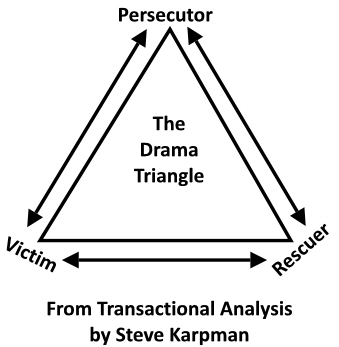 The Drama Triangle is a model of dysfunctional social interaction, created by psychotherapist Stephen Karpman. Each point on the triangle represents a common and ineffective response to conflict, one more likely to prolong disharmony than to end it. Participants in a drama triangle create misery for themselves and others. Each player in this particular mind game begins by assuming one of three archetypical roles: Victim, Rescuer, or Persecutor. • Victims are helpless and hopeless. They deny responsibility for their negative circumstances, and deny possession of the power to change them. They do less than 50%, won’t take a stand, act “super-sensitive”, wanting kid glove treatment, and pretend impotence and incompetence. • Rescuers are constantly applying short-term repairs to a Victim’s problems, while neglecting their own needs. They are always working hard to “help” other people. They are harried, tired, and often have physical complaints. They are usually angry underneath and may be a loud or quiet martyr in style. They use guilt to get their way. • Persecutors blame the Victims and criticize the enabling behaviour of Rescuers, without providing guidance, assistance or a solution to the underlying problem. They are critical and unpleasant and good at finding fault. They often feel inadequate underneath. They control with threats, order, and rigidity. They can be loud or quiet in style and sometimes be a bully. Players sometimes alternate or “switch” roles during the course of a game. For example, a Rescuer pushed too far by a Persecutor will switch to the role of Victim or counter-Persecutor. While a healthy person will perform in each of these roles occasionally, pathological role-players actively avoid leaving the familiar and comfortable environment of the game. Thus, if no recent misfortune has befallen them or their loved ones, they will often create one. In each case, the drama triangle is an instrument of destruction. Victims depend on a 'saviour', Rescuers yearn for a 'basket case' and Persecutors need a 'scapegoat'. A good example of the game could be this fictitious argument between John and Mary. Sometimes the Rescuer’s point seems calm and even reasonable. If the words placate, soothe, calm, explain or justify, it can be considered a Rescuer response--it is an attempt to move the other person from their position. In order to give a visual of the way the participants move from one point of the triangle to another, the Persecutor position is shown in red, the Rescuer in blue and the Victim in green. Mary: Sure, as if taking care of the house and kids isn't WORK! (P)"
Feel free to continue this in your own time! Is there a way out of the triangle? This is known as the drama triangle because drama is its main aim. Taking any position on the three points will give you a starring role in your own entertainment. The role with the most power to keep everyone else stuck is 'Victim'. From 'Victim' it's possible to cast others in the role of 'Persecutor', even if they don't want to take that role. Some Victim lines for you to consider:- “You never listen to me!” “You always put me down!” “You say such hurtful things”. As 'Victim' we can also appeal to those who would rather do anything than face conflict. They become 'Rescuers' and do their best to find solutions for our problems. As 'Victim', solutions are the last thing we want as this will spoil our 'drama'. If this is our 'drama' it's very easy to keep everyone confused by moving swiftly between 'Victim' and 'Persecutor'. In the above example Mary had a go at all three roles! "Am I choosing to play this part?" It's amazing once you take a step back from the current drama, how other options open up to you. Let us know your own variations of this game and any ways you have found to get out of it. Thanks for outlining this very helpful model. It can be so easy to slide into one (or more) of these roles and it's helpful to be reminded to step aside and stop perpetuating the drama. Food for thought!